Last month, we featured one of our sparrows as part of our 12 Months of Birding at the Inn series on the blog in 2014. This month, our sparrow love continues, with our July pick: the Eastern Towhee. The Eastern Towhee is a year-round resident here in Pisgah National Forest east of Black Mountain, NC. They’re more often heard than seen, although you may catch a flash of reddish orange and black scurrying on the ground around the Pool Garden and the birdfeeders as that’s where the Eastern Towhees like to scoot out from under the burning bush hedge to graze. 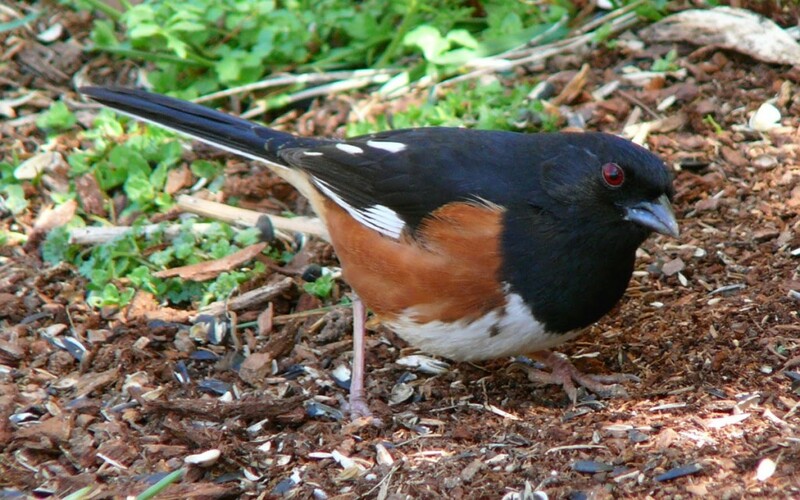 Eastern Towhees prefer to forage on the ground, often in leaves, and also through dense shrubs. They’re omnivores with a varied diet of seeds, insects, snails, fruit (blueberry thieves), grasses and also spring flower buds. The Eastern Towhee is pretty easy to identify. It’s a medium-sized, chunky bird with reddish orange sides and a white belly. Males are jet black on their heads going down their chests, as well as on their backs. Trade the black for brown with the same orange and white pattern on the sides and belly and you have the female Eastern Towhee. This entry was posted in Uncategorized and tagged 12 Months of Birding at the Inn, Asheville, birding, Black Mountain by Inn on Mill Creek. Bookmark the permalink.